We are witches on Halloween! Sing and dance with Bounce Patrol this Halloween – ride your broom, wave your wand, cast a spell and stir your potion like a spooky wicked witch! Grab your broomsticks and let’s go flying through the air… Be the witchiest witch the world has seen, when you’re a witch on Halloween! 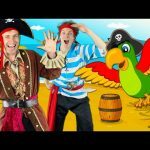 Bounce Patrol make original songs and nursery rhymes for kids – from toddlers and preschool, through to kindergarten and elementary school age.